I would have to say that CC Creams are the in thing now. Almost every brand is dishing one out and brands that didn’t jump the bb cream bandwagon on time made sure to catch this wave. I still remember reviewing the very first one on the market – the Rachel K CC Cream – and now it’s a category of make-up. If you don’t know what CC creams are, they are just a more refined version of bb creams. That means you’re looking at more skincare ingredients, finer texture, more coverage – basically bb creams 5.0. A lot of brands are trying to differentiate their cc creams though and I find more korean versions gearing towards cc creams that have “color adapting technology” – meaning that they come out white but “turn your into your skin color” once rubbed in. However swanky and cool, I don’t really believe it. This “technology” is usually caused by micro capsules that contain pigment and break once rubbed into the skin. It’s not brand new news either with Revlon first coming out with it when I was still in High School. 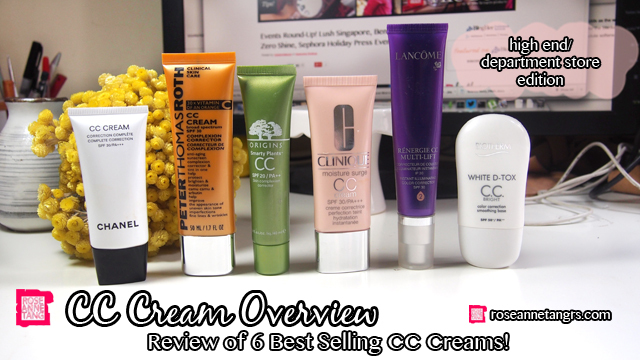 Today I’m going to be reviewing my high end stash of CC creams. I have lower end versions as well which I will talk about later. 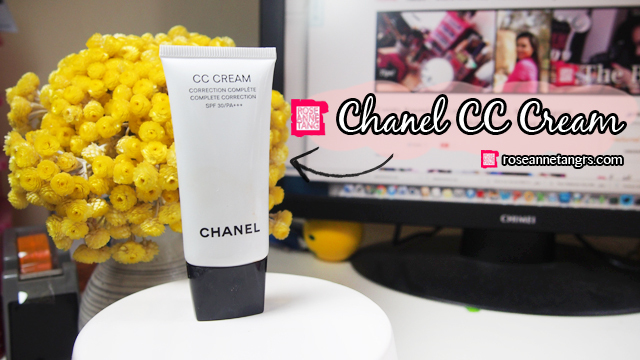 The first is the Chanel CC Cream! This is probably the most popular CC Cream at the department store. 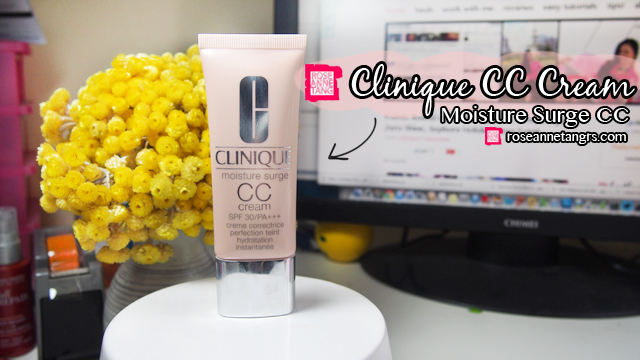 The good news about this CC cream is that it has great texture and it has medium to high coverage. It was rare back in the day to find a bb cream with high coverage but I’m happy to find that companies are listening and are making their cc creams less gray, warmer toned, and have more coverage. This has great coverage correcting uneven skin tone and hiding light blemishes. When applied, it looks as if it has a matte to semi-matte finish but you’ll find that throughout the day or even after an hour or so, it will mellow out to a glowing finish. It’s a bit tricky this one. The only thing I would watch out for is the smell. When I first found it at the Chanel counter, it smelled horrible. It smelled expired and off and I wondered how such an expensive label could produce such an awful smelling make-up product. I mean wouldn’t they know? Wouldn’t they control their testers at their counter? When I first received the product, I opened it, squeezed some out and was happy to discover that it had a pleasant floral smell. You can watch my youtube review if you scroll all the way down to watch my first impressions. Then, it turned sour quickly after about a minute. The second time I used it (a bit unwillingly because of the smell), it didn’t turn sour…that or it was the mosquito spray I sprayed all over my room. So it’s weird. Overall though, I really do think the smell is overpowering and not a pro of this product. I give this a 4/5. Next up is the Clinique Moisture Surge CC Cream. With this, you’re looking at very light coverage. It has that water based appearance and is able only to correct uneven skin tone. There’s about a 2 in coverage. The smell is pleasant skincare/sunscreen smell. It blends evenly into the skin but I need the coverage so I give this a 3/5. 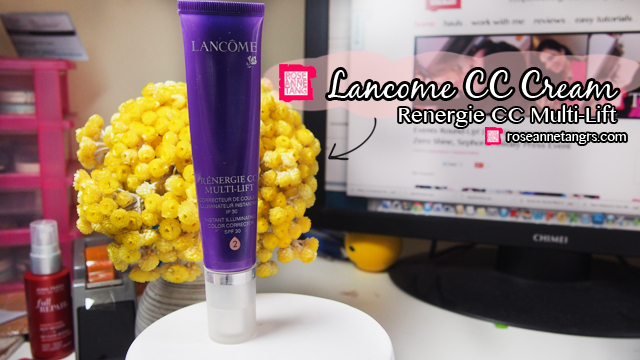 Here’s the Lancome CC Cream Regenerie CC Multi Lift. This one is a bit of a let down for me. I think this must be a great CC cream for dry skin. It is extremely gloopy and oily and not good for combination or oily skin types. I think it is also better for the more mature ladies who need something more moisturising so there are pros and cons of this product. When I first applied it, it was extremely oily. I really did feel that I was applying a layer of oil onto my face. After a few minutes though, the oil does “dry out” or “fully absorb” into the skin so it’s not totally not tolerable. I still think that with all the choices, it’s hard to label this as a favourite despite the texture drying out. It gives an even coverage, being medium, and is able to correct uneven skin tone and hide light blemishes. 2.5/5 for me. 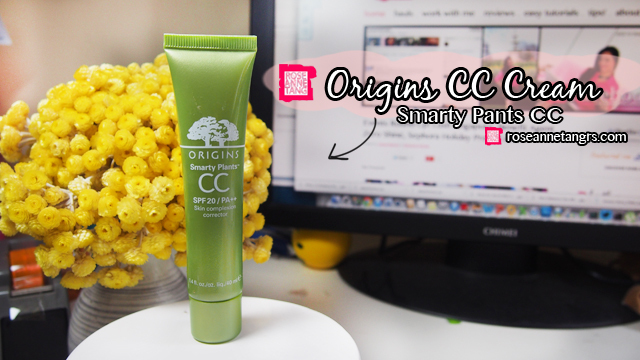 Here’s a pretty new CC cream – the Origins Smarty Pants CC. It’s SPF 20 and has extremely light coverage. Be warned, this is basically like a tinted moisturiser. It smells like botanical oils/spa which is nice but way too little coverage for me. It barely does anything to be honest. It’s really sheer but it does have more natural plant extracts so if you’re into that and have great skin then, yay. For me though, it’s a 2/5. 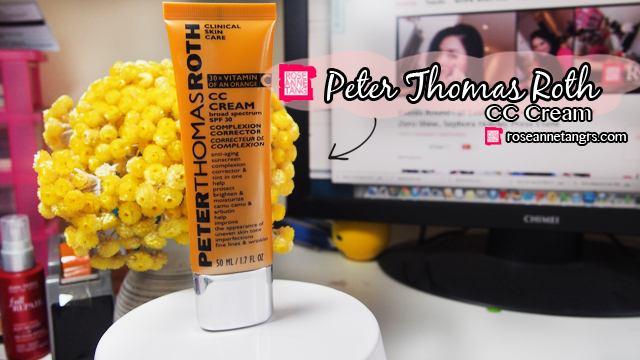 This is would be my favourite CC Cream so far – the Peter Thomas Roth CC Cream. It’s about $85 at Sephora Singapore but it’s a good investment if you have my similar preferences. It has great coverage – high coverage with the ability to correct uneven skin tone (a given), blemishes and can even double up as a concealer. Great texture, blend-ability and yes – even smell. There’s a whole host of skincare benefits which it lists on the bottle as well including anti-ageing properties too. There’s an in between of semi-matte to semi-glow which is perfect. For me, this is your best bet for a high end cc cream at 5/5. 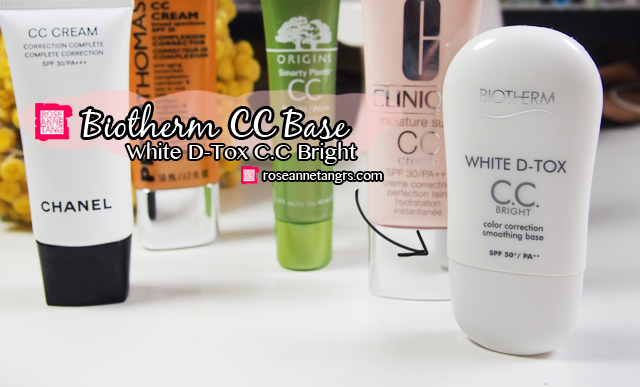 Last one that’s part of this overview is the Biotherm White D-Tox CC Bright. Biotherm has installed their own take of CC creams and have made small little bottles that do different things. From what I understand, other Biotherm CCs colour correct the skin and may be tinted purple or green to colour correct. This one is the CC Bright and is supposed to make your skin bright, fair and radiant. That being said, I would yes treat these more as make-up bases/primers than actual CC creams but I’ve had a lot of questions about them so that’s my answer. It comes out totally as a white cream and oddly enough, it blends into the skin well and is still able to correct uneven skin tone which is great. I do like the matte/semi-matte finish and the more primer/silicone feel to it rather than an actual cream. It’s kind of a different league to be honest – not really in terms of quality – but more so type of product. Overall, it’s a 4/5 for me. I really hope you liked this review! Life has been really busy lately so sorry for the lack of updates. Do follow me on instagram @roseannetangrs to keep in touch though. By the way I just got a Samsung Note 3! Oh my gosh, I’m an android user and so far I’m really liking being able to totally customise my phone. I’ll probably blog about it later! Have a great weekend! Review: L'Oreal True Match Foundation! One of my Everyday Favourites!